The Happy Camper and good friend Andy Baxter paddle for three weeks around Ontario's Algonquin Park - completing 93 portages that add up to 68 miles. Andy says Kevin isn't allowed to organize any more canoe trips. Don't miss this presentation. It's a classic. 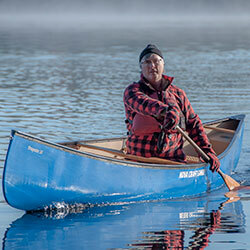 Author Kevin Callan paddled the full length of the Thames River in southwestern Ontario. It runs 300-plus kilometres and is the most southern watercourse in Canada. The trip had a bit of Huck Finn flavor to it. The Thames is an urban river with farms, cities and small hamlets found along the way. Kevin had to think outside the box on this one, making for one incredible misadventure.